FCAP membership comes with many benefits. Among those benefits is the sharing of information across the state each week through a weekly e-mailed newsletter called FCAP Member Advantage. Among the items you will see are new features such as breaking news and industry resources you can use and implement in managing your community association. Below is an example of the kind of useful and practical information FCAP provides as a benefit of membership. According to Rule 61B-23.002 of the Florida Administrative Code, each condominium association must prepare and maintain a Frequently Asked Questions and Answers (FAQ) sheet. The FAQ sheet must be updated every 12 months. To aid in compliance, the Department of Business and Professional Regulation (DBPR) created F.A.C. Form CO 6000-4, a fillable PDF consisting of seven questions relating to unit owner voting rights, maintenance fees, and association ongoing legal issues. Associations may create their own FAQ sheet, but it must be similar in form and substance to CO 6000-4. Compliance couldn’t be easier and yet this rule is often overlooked. If your association is professionally managed, make sure your CAM has updated your FAQ sheet and has it available to current owners and potential buyers. The FAQ sheet must be maintained as part of the association’s official records. If you are not receiving FCAP Member Advantage, I encourage you to go to the FCAP website at www.FCAPgroup.com and subscribe. FCAP, Florida Community Association Professionals, began as an idea in January 2001. Discussions began that month about the possibilities of bringing the industry together on a statewide level through a professional organization. Florida is unique in its need for a strong network of information in the community association industry. Things are in constant change. The laws change every year, but that’s not all. Every industry has its own technology, and technology is moving forward at a pace that’s hard to keep up with! Florida needs a dedicated organization that will bring together those with the information and those who need the information. FCAP was announced in the December 2011 issue of the Journal. In the two-and-a-half years since then, membership has grown past the 1,500 mark. We expect it to pass 2,000 in 2014. Even at its young age, FCAP is in the middle of its first major overhaul—adding online training options for managers who are too busy to carve 40 hours out of their schedule to attend in-person classes. By the time you read this, the new FCAP identity will have been introduced through the new website www.FCAPgroup.com. The new website will more accurately reflect the services that support the organization—FLCAJ magazine, “The Show” Expo, and CondoJobs Recruiting Service. 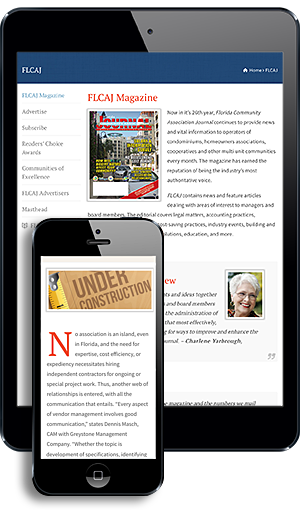 If you have bookmarked Florida Community Association Journal, the www.flcaj.com link will now redirect to the FCAP Group site. The following screen captures provide a snapshot of the new website. We encourage you to explore the new site and if you haven’t already, consider joining FCAP. Our goal is to raise professionalism in the industry through education. If you have any questions, please call Lisa Whitson at (561) 277-8152 or (866) 828-9267. 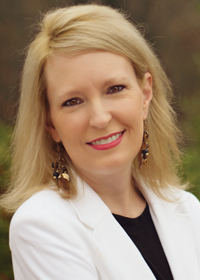 CondoJobs Director, Lisa Pinder and FCAP Director, Lisa Whitson recently sat down to discuss realistic expectations of the job market for new community association managers in Florida. Here is Part 2 of that series. To see Part 1, please refer to the July 2014 issue of FLCAJ. LP: In part one, we talked about realistic expectations. Knowing that as a new CAM the path to landing that first CAM job can be challenging, I feel it is important to have a support system and someone to work for you on your behalf. Do you agree? LW: Absolutely. Having an organization like FCAP going to bat for you as a new CAM is invaluable. There are so many different ways we all work together to help the new CAM during their search. FCAP offers a statewide network of information CAMs can tap into with just a mouse click. There is also the magazine, Florida Community Association Journal where all of this got started as Managers Report almost 28 years ago. We have the strength of CondoJobs, which you have built into a premier recruiting service in the industry, FCAP offers a membership organization, a professional designation program, and trade shows where we can all meet and network. LP: We all want to work with anyone who is interested and qualified to work in this industry. But you are right about the job search being difficult. It can also be difficult for those who have been in the industry for years and because of circumstances are faced with change. I’ve noticed a particular vulnerability when I relocate a CAM to a new area of the state. That’s why I always try to match up transplanted managers with other CAMs in the area. It gives the relocated CAM a local network to rely on and ask questions of. How Does Culture Impact a CAM Position? LW: There seems to be cultural differences in the way business is done from one part of the state to another. At the FCAP Open House in March, I talked to a manager who relocated from the Panhandle to Palm Beach county. In her community along the Panhandle, she reported to a board made up mostly of non-resident owners, and her days were spent alone in a quiet office. 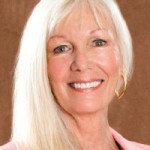 Her new management position in West Palm Beach reports to a very hands-on board of year-round residents. Her office today is full of people, noise, and activity. Rarely is she alone when she walks the community, and all the residents have the potential to be her “boss” at some point. LP: That’s exactly why it is important to have a support system. Can you imagine going from working alone every day to an office full of residents and staff members? It can be a real culture shock. As a matter of fact, a Condo-Jobs networking group has formed on its own because of the need for CAMs to connect with each other. A group of CAMs I placed in the Fort Lauderdale area have started networking with each other and keeping in touch on a regular basis. LW: I understand that CondoJobs is very selective about who it represents. The managers must have a current, active, and clean CAM license, as well as acceptable credit. Some CAMs may choose not to use a recruiter because of the fees involved. As we mentioned before, you are also tasked with balancing the needs and requirements of the community with the skills, talents, and management style of the managers. With that in mind, how do you see FCAP and CondoJobs working together to serve CAMs in this industry? LP: It’s true that not all CAMs will choose to use CondoJobs as their recruiter. However, all CAMs can choose to be a part of FCAP, subscribe to the magazine, attend conferences, and network. We are all part of the same family of services and provide benefits across the state. Whether it’s a new CAM in Jacksonville or a CAM who has been in the same job for 20 years in Naples, there is a benefit to being a part of the FCAP family of services. If you have a CAM career success story you would like to share with us, please contact Lisa Whitson at lwhitson@fcapgroup.com or Lisa Pinder at lisa@condojobs.com. Being proud of our accomplishments has always been the American way and for me, this feeling of patriotism followed over into FCAP’s celebration of its first membership renewal period. Paying my first renewal fee was a celebration of FCAP’s longevity, growth, and wide acceptance as the authority for Florida-specific education. We are very proud of our members whether they are accountants, attorneys, management companies, managers, volunteers, or service providers, we are Florida Community Association Professionals! If your membership is ready for renewal and you haven’t made that commitment yet, please do so and be sure to invite others to do the same. FCAP is also accepting new memberships and together we are a voice for raising the bar of excellence in our industry. We have a message for owners in communities all over the state of Florida, our designees are informed and trained in their field at the highest levels possible. The Show Is Coming to Orlando! Many of us plan to meet in Orlando on September 26th for “The Show,” our second of this year, and our second celebration of being an organization developed with a consciousness of raising the bar of professionalism in an industry that effects the majority of Floridians.